Kub Kao Kub Pla had a menu outside which I read before going in. Luckily, their food items had English translations. That was actually the primary reason for me choosing this place, because I found a food item I was certain I’d enjoy. However, unlike the cafeteria food at AIT, I also noticed that the prices are inflated, up to three to five times what I paid previously. Still, I considered that this was a nice place to rest after a tiring excursion around the mall. I ordered (with some difficulty, I mostly pointed my fingers to the menu) their Pad Thai with Prawn (240 Baht), which by experience had been always delicious. I also ordered their Stir Fried Cabbage with Fish Sauce (180 Baht). 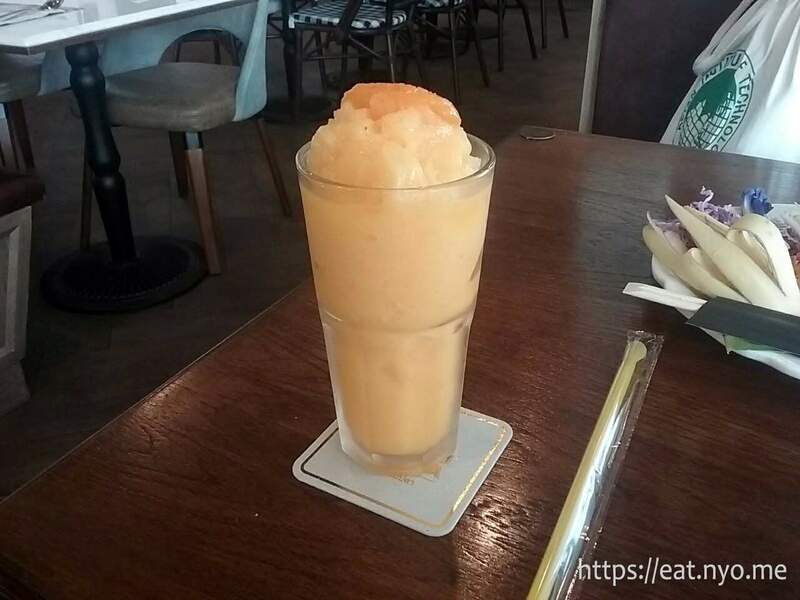 I wanted to try their Thai Iced Tea, but they were out, so I got their Peach Mango Slush (149 Baht) as recommended (by pointing) by the waitress. The colorful Pad Thai with Prawn was served in a plate filled to the brim with stuff. It was quite colorful, featuring the noodles topped with shrimp, eggs, tofu, and other veggies, bean sprouts, peanuts, shredded purple cabbage, a wedge of lime, a flower, and a couple of other things that I’m not exactly sure what. The left one that looked like a part of a banana plant was a bit bland, but did have some nice texture to it. The right one that was dark green was quite minty, so I assume it’s that. It was served with additional side seasonings including fish sauce, sugar, soy sauce, and chili flakes, but I didn’t bother adding anything. It was already quite delicious on its own. The accompaniments were not as flavorful as the noodles which had most of the flavor, but they do provide a nice texture contrast. This was definitely a head above the Pad Thais I’ve eaten locally. Perhaps the most memorable food item I’ve eaten in this trip is the Stir Fried Cabbage in Fish Sauce pictured above. 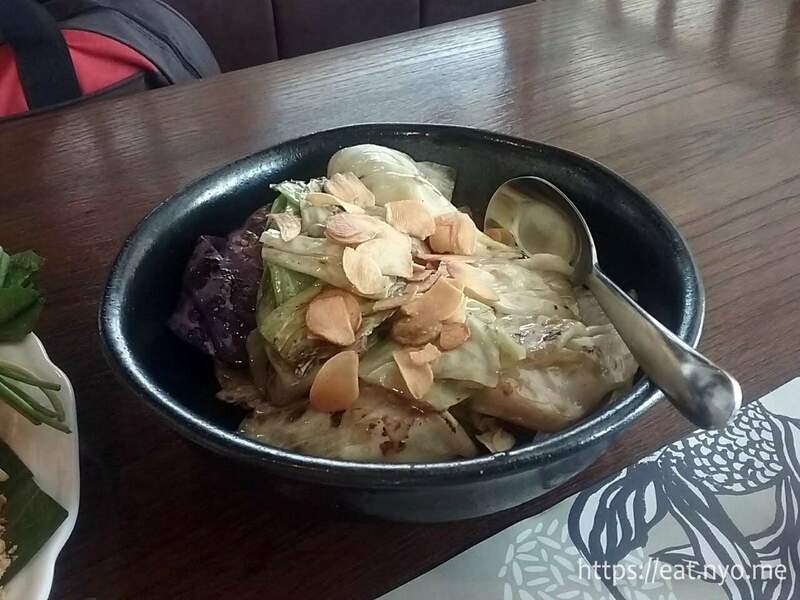 It’s a seemingly simple dish—cabbage leaves of two colors, green and purple, coated in oil and fish sauce and topped with garlic flakes. I found it much more delicious than the Pad Thai, which was already quite flavorful on its own. I’d liken this to the eggplants I had in [the Netherlands], not that they tasted the same, but that they had the same memorable, wanting-for-more effect on me. Although this dish was probably meant to be shared, I managed to finish the entire bowl. Finally, my drink, the Peach Mango Slush was surprisingly not too sweet. The mango and peach flavors were definitely there, but it’s apparent that they put in little to no sugar in this drink. It really felt like a pure puree of the two fruits. I guess the main complaint is that this costed three times a normal meal in AIT on its own. I get to experience the expensive side of Thailand in Kub Kao Kub Pla. My total bill amounted to almost 630 Baht after a 10% service charge. With that amount, I could’ve eaten a buffet already back home. That’s also not counting the loss that I had for converting PHP to THB and the ATM charge for Baht withdrawal. However, I’ll admit that the experience probably won’t feel the same and I probably ate a meal for two people. I could’ve also cut down the cost if I didn’t order the slush; not that I regret it, it was quite good, one of the better fruit drinks I’ve had in recent memory. Actually, all the stuff I ordered were overall delicious. 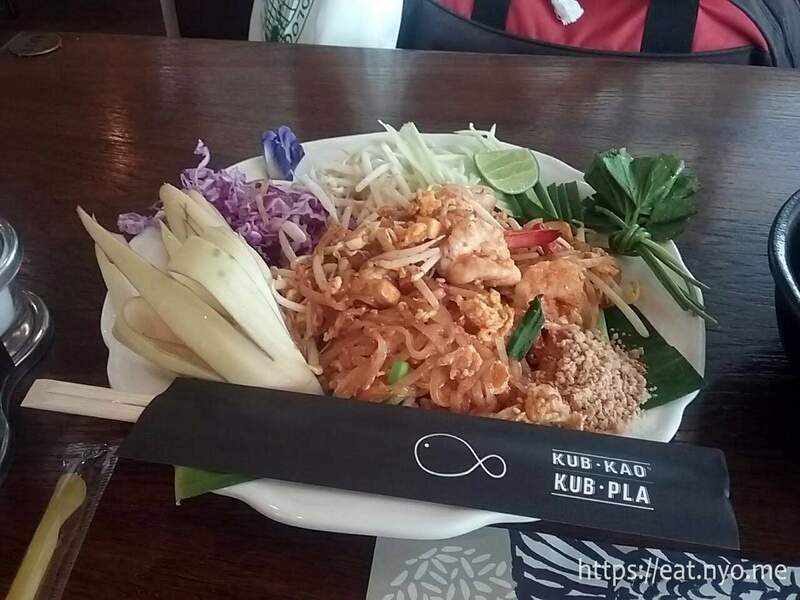 If you got some Baht to spare and want to eat good Thai food in a relaxed environment, Kub Kao Kub Pla gets a safe recommendation from me. Location: Megabangna Shopping Center, Thailand. Recommended for: Groups of Thai food lovers with money to spare. Smart nomnomnom tip: Thai servings are quite big and good for sharing; come in a group.